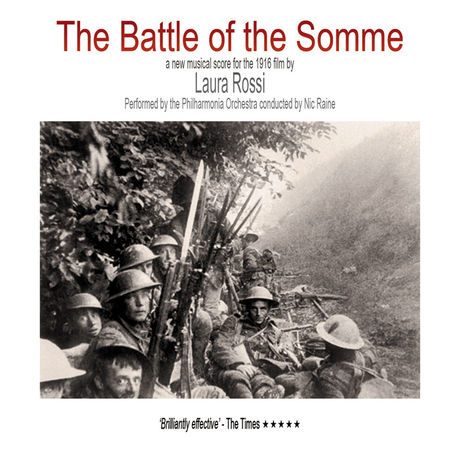 Laura Rossi was asked by the Imperial War Museum to compose a new score for the 1916 film The Battle of The Somme to commemorate the 90th anniversary in 2006. Performed by the Philharmonia Orchestra under the baton of Nic Raine, the CD was released in 2008 at the same time as the DVD release of the restored documentary film. I have to admit that this is the only candidate film for 1916 I’ve had a chance to listen to but that does not detract from the fact that it’s a beautiful work full of emotion. The score presentation takes the form of a 5-track suite (no track lasting less than 10 minutes) and the music is written for full orchestra and could be taken from film score written today. There’s no action scoring here – as you may expect for a film about a battle. Having only heard this score and not seen the film I would suspect that the emphasis is firmly on the men who fought and died. The music conjures in the mind images of innocent men (perhaps represented by the predominant use early on of a variety of wind instruments) going off to battle, perhaps not knowing what they are about to face. As the score progresses the presence of these winds diminishes as the innocence is lost. By the end of the score brass is not the predominant section of the orchestra, firstly playing in sombre tones in tribute to the fallen and then, in the final few minutes of the score, rising in celebration of the sacrifices made for the Greater Good. The final few minutes are particularly upbeat, perhaps indicating the final end credits of the film? If so, then it did tend to highlight the filmic nature of the piece. The middle section of the score is a restrained feel with the emphasis of textures via strings echoing the horrors of war. War itself seems to be played out by claps of large precussion instruments intruding into the orchestra and rumbling timpani.